William B. Wilson was very respected for being fair and unbiased in his opinion and was often asked to give his opinion on different matters, not only by the miners but by businessmen as well. A group of men noticed outcroppings of coal between Blossburg and Arnot and decided they should mine the area. They consulted several people, Wilson included. Each advised mining the property except Wilson. His report was that the veins were so located that it would not pay to work them. However, the men purchased the property and tried to mine it. 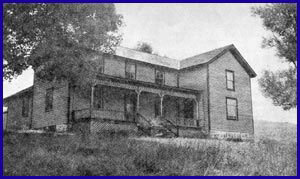 After William’s death in 1934 the farm was sold to the American Legion Post No. 572 of Blossburg in 1937. The Legion Post is still located there today.